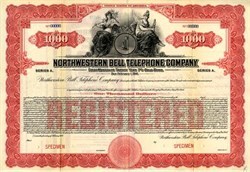 Beautiful engraved specimen certificate from the Northwestern Bell Telephone Company dated in 1921. This historic document was printed by American Bank Note Company and has an ornate border around it with a vignette of an allegorical woman on each side of a candlestick phone. This item is over 86 years old. The Mountain States Telephone & Telegraph Company provided local telephone service in the Rocky Mountain region of the United States. MST&T commonly did business as Mountain Bell, and provided telephone services in Colorado, Utah, Arizona, New Mexico, Montana, Southern Idaho, Wyoming, and the El Paso, Texas vicinity. Additionally, MST&T acquired controlling interest in the Malheur Home Telephone Company in Oregon, better known as Malheur Bell. MST&T operated Malheur Bell as a wholly-owned independent subsidiary; an arrangement that continues to this day with Qwest. Prior to 1984, AT&T held 88.6% in Mountain Bell. Usage of the Mountain Bell name has recently been reactivated by Unical Enterprises, who began producing telephones under the Mountain Bell name in 2006. The Mountain Bell headquarters was located at 931 14th Street in Denver, Colorado. Northwestern Bell Telephone Company served the states just north of the Southwestern Bell area, including: Iowa, Minnesota, South Dakota, North Dakota, and Nebraska. The Northwestern Bell name is still licensed for use today on telephone equipment produced by Unical Enterprises; otherwise, the NWBT name has disappeared. Dex Media white pages lists a customer service number under the Northwestern Bell name (which connects to Qwest). The Northwestern Bell headquarters was located at 1314 (DOTM) Douglas Street in Omaha, Nebraska. Pacific Northwest Bell Telephone Company provided telephone services in the states of Oregon, Washington, and northern Idaho. Pacific Northwest Bell was created on July 1, 1961, when the Bell telephone operations in northern Idaho, Oregon, and Washington state were split off from Pacific Telephone & Telegraph. The same was done when the South Central Bell territory was divided from Southern Bell. Prior to 1984, AT&T held 89.3% in Pacific Northwest Bell. Pacific Northwest Bell's headquarters are at 1600 7th Avenue (also known as 1600 Bell Plaza), in Seattle, Washington. In 1984, the Bell System was broken into seven Regional Bell Operating Companies. U S West, Inc. became a holding company for Mountain Bell, Northwestern Bell, and Pacific Northwest Bell. On January 1, 1991, US West merged its three Bell Operating Companies into one entity, U S West Communications, Inc., headquartered in former Mountain Bell offices. US West, since 1984, had been selling telephone equipment under the Northwestern Bell name. 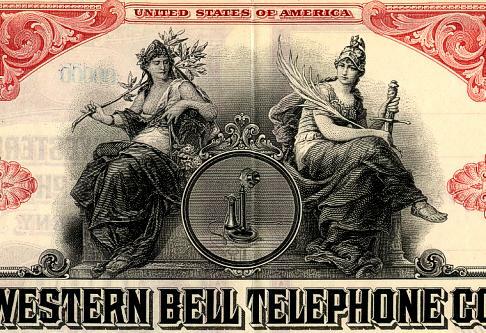 In 1992, US West granted Unical Enterprises, whom had been producing phones under the "La Phone" brand, the right to become the exclusive licensee to produce telephones under the Northwestern Bell name, which are produced to this day under the BELL Phones by Northwestern Bell Phones brand. In 2000, Qwest Communications International purchased US West in a hostile takeover after unsolicited bids to merge with U S West had been denied. U S West Communications, Inc. was then renamed Qwest Corporation.